Welcome to the International Selections and Trials home page. Here you will find information on all the England representative teams, who they are, how they fared and how you can try out to join them. Applications are invited for those wishing to play in the 2019 Premier League. 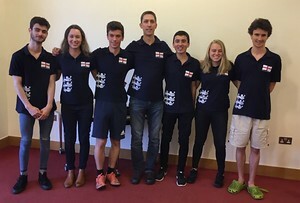 The event takes place over three weekends in the autumn, and acts as an international trial, with the winners of the First Division earning selection to represent England in one weekend of the 2020 Camrose Trophy series, and in the European Champions' Cup 2020, if England qualifies. It is also part of the Championship Series, with points earned towards the Player of the Year competition. Applications to dawn@ebu.co.uk by Friday 31st May 2019. The entry fee will be £860.00 per team. This weekend saw the 2nd and concluding weekend of the Camrose Trophy, the annual competition between England, Ireland, Northern Ireland, Scotland and Wales. The EBU hosted this second weekend of the Camrose Trophy, in Coventry, and therefore England were eligible to field two teams. The EBU Team (pictured left to right) of Peter Taylor, Cameron Small, Jon Cooke, Chris Dixon (NPC), Ben Green, Ankush Khandelwal & John Cox, finished top with a total of 141.58 VPs. Also playing on behalf of the EBU in the first weekend of the Camrose were Peter Hasenson (NPC), Gerald Tredinnick, Gunnar Hallberg, Derek Patterson, Andrew McIntosh, Andrew Black, Phil King). In second place were the England Team of David Burn (NPC), Alexander Allfrey & Andrew Robson, Tony Forrester & Graham Osborne, David Gold & Mike Bell, with 126.41 VPs. Also playing on behalf of the England team in the first weekend of the Camrose were Janet de Botton & Artur Malinowski; Espen Erichsen & Glyn Liggins; Tom Townsend & David Bakhshi; NPC Alan Mould. Northern Ireland were third with 109.65 VPs. For the third year in a row, England has retained both the Junior Camrose and Peggy Bayer Trophies, which this year was hosted by Ireland at the weekend. In the Junior Camrose, the England team finished with a total of 152.04, Scotland were second with 145.58. In the Peggy Bayer competition, England were emphatic winners, finishing with a total of 171.33, 2nd placed Ireland finished on a total of 95.27.